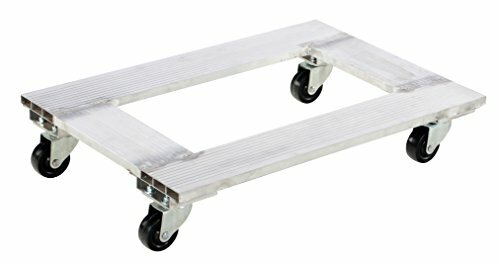 The Vestil ACP-2130-9 aluminum channel dolly has four swivel solid rubber caster wheels and a frame made of channel-shaped aluminum, and can be used to transport appliances, crates, furniture, or other large, heavy objects. The dolly is made of aluminum, which weighs less than steel and cast iron and is resistant to rust and corrosion. The aluminum is channel-shaped to resist bending. The caster wheels swivel for maneuverability, measure 1-1/4 inches wide and 3 inches in diameter, and are made of solid rubber, which can’t go flat and is resistant to wear. This dolly has a load capacity of 900 lb., weighs 16 lb., and measures 6 x 21 x 30 inches (H x W x D). (H is height, the vertical distance from lowest to highest point; W is width, the horizontal distance from left to right; D is depth, the horizontal distance from front to back.) This dolly is suitable for use with a pull strap or hook (sold separately). It is intended for use in professional and industrial environments.